Samsung has been recently criticized to a big extent, and the electronics giant finally had to ditch its own chapter from the book and move ahead with some new plans, in designing its smartphones. The difference isn’t huge, but what Samsung did to make the Galaxy Alpha smartphone, was enough for the critics to appreciate it, and accept this as a fresh idea from the company. The metallic frame on the sides of the device easily makes the Galaxy Alpha a clear beauty in the Samsung’s Galaxy lineup. We in fact didn’t totally hate the Galaxy S5‘s design, because although it is a fact that Samsung’s smartphones are all the same in design, but we never felt that the company has to bring about any changes because these were all designed for ease of use, handling and to be good in comfort. The design was a sole reason though, for many to skip buying this, and the Galaxy Alpha now comes with the same reason being the USP for it. 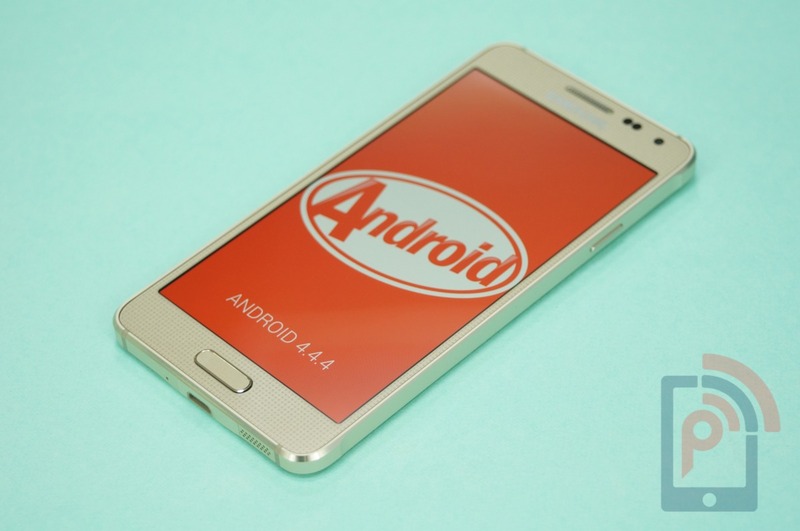 The phone is awfully smaller than the Galaxy S5, and slimmer as well. But that is what makes this a perfect piece in the hand. The beveled edge on sides, raised corners on the real metal frame, and the different smooth but ditched texture on the back, each of it add to the comfort and good feel while holding the Alpha. 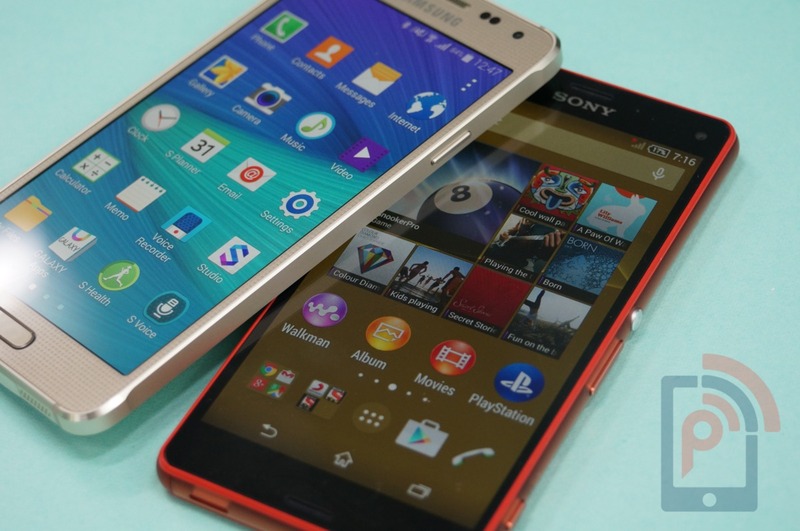 Hey, but is the Galaxy Alpha the best of the smartphones out there? Samsung has made a lot of compromises, unlike the other brands that have accepted the fact that although the specifications don’t make a huge difference most of the times, the spec sheet is what the users tend to check before deciding the purchase. Even Motorola had to do that, and thus the new Moto X came in with the latest best specs. Samsung has taken one step right, with the design. But they put the foot in a wrong place, when specs are taken into consideration. The display size is kept to 4.7-inch, but Samsung has given it an HD resolution, and similar is a case about the camera compromise as well, as the company packs in a 12-megapixel rear camera on the Galaxy Alpha. There is no MicroSD card slot as well, although 32GB internal storage is packed in. Samsung has managed to give the phone enough power to keep it one among the best in terms of performance, because the US model has the Snapdragon 801 chipset, while the International one comes with the Exynos 5 Octa-core processor. This is one such rare attempt from Samsung where they are trying to sell a device, more for its design than anything else. The attempt hasn’t gone wrong, because the compromise with the specs isn’t very huge and the Galaxy Alpha is able perform well, without breaking a sweat, thanks to the good internal power it has got. One who has been a fan of Apple for the iPhone design and size, and Samsung for the brand value it has, would easily be able to relate between the Galaxy Alpha and the iPhone 5s. There are chamfered edges, metallic frame, a rectangular side profile and also, a fingerprint scanner in both. But the striking similarities aren’t taking the Alpha away from Samsung’s flavor, as the company has still used the same polycarbonate material for the back cover, and the front design is no different from the earlier Samsung smartphone designs. The dimpled back what we saw in the Galaxy S5, is not seen here but the dotted texture is still there on the removable back cover, and it feels better. It is not again the first time that we are seeing some textured pattern on the front, below the glass panel. The power key on the right, volume key on the left are both hard to press and thus, you get a better comfort while operating them, to find that the button is actually pressed. The Alpha possesses a heart rate sensor on the back, alongside the LED flash for the camera. 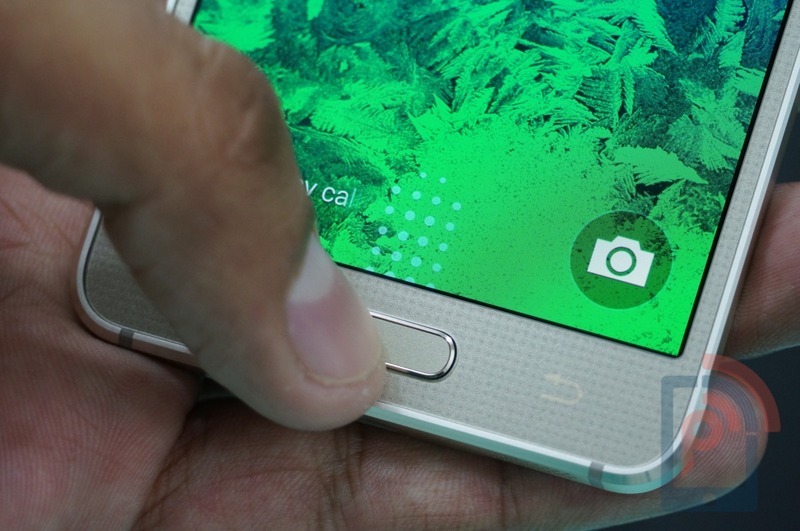 And just like in the Galaxy S5 and Note 4, there is a Finger scanner in the home button. The bottom is slightly wider towards the MicroUSB port area, and that alters the corners of the back cover as well, and the bottom frame has the speaker grill and a microphone as well. The secondary mic is located on the top, just beside to the headset jack. And because the back cover is removable, you don’t see any SIM slot on the side. The 4.7-inch display on the front is a perfect size for one-handed operation, for those who had complained about the hard-to-use 5.1-inch size on the Galaxy S5, or any competitor phone. The user can easily reach to the corners of the screen, and talking about the quality of the display, it is a 720p Super AMOLED one with some brilliant output of colors, good viewing angles and under the sunlight, the brightness is good as well. In fact, the display was even brighter and easier to read on, when compared to some flagships such as Xperia Z3 and LG G3. But, the pixel density is less, though not noticeable, but a factor that keeps it low-key when comparing. There is one issue that Samsung users have been complaining of, in the recent times. It is the color saturation, where the bluish tone is more than natural, and although Samsung gives some options to change the color mode, that bluish color isn’t going away. The same is seen even in the Galaxy Alpha, although reduced by a large extent, making it almost similar to the color output on Sony Xperia smartphones, which come with perfect white balance. 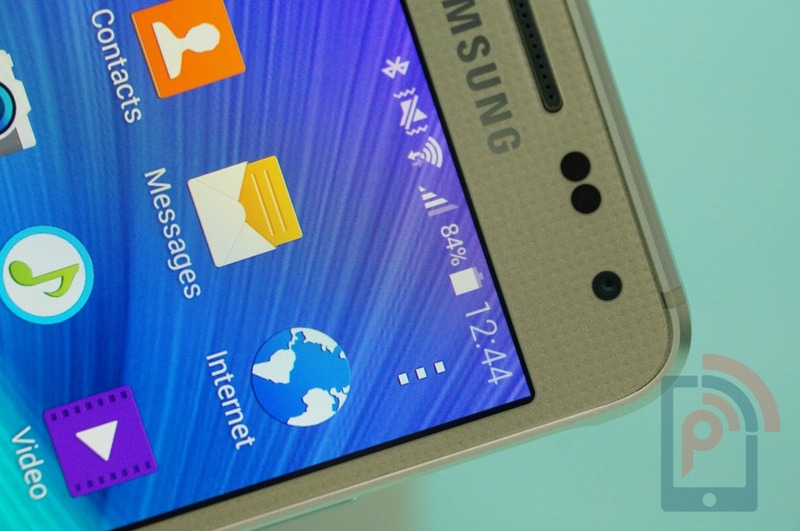 No surprises there, Samsung has layered the TouchWiz UI over the Android KitKat OS, and it is similar to that on the Galaxy S5, with the differently designed quick settings and Settings sections, and many differences from the standard TouchWiz UI. The “My Magazine” news aggregator takes up the place of first home screen, and there are multiple home screens for the user’s advantage, to place shortcuts or widgets. Pulling down the notification panel, there are a lot of quick settings and the user can edit and rearrange them. There is not a big bloatware here, because you see just a few S apps apart from the Google play apps. The Samsung apps include Studio, Galaxy Apps marketplace, S Health, S Panner and S Voice. The S Health is again similar to the one on the flagships. The Finger Scanner on the Galaxy Alpha is more accurate than what we saw on the Galaxy S5, though that could be more because of the software tweaks than hardware. There is Download Booster, Ultra Power Saving Mode and Screen Mirroring options, while the smart features include Smart stay, Smart pause and Multi-window. Samsung has also managed to pack in all the personalization features such as Easy Mode, Blocking Mode and Private Mode, apart from the gestures (including palm swipe to capture) and Air View. The performance is swift, to say it in short. There was no such app or section where we saw the phone to lag even a little. Even the high-end games played like they were being played on any flagship smartphone, and why won’t they, the processor and GPU combination is one of the latest best, and 2GB RAM was good enough to handle multitasking pretty well. That does take some toil on the battery, and as expected there is some quick battery drain we observe especially when the screen is active and when graphics are played. Well, did you expect the 1860 mAh battery to stay good for long? Though, this was the case when we tried to check purposefully. The Alpha does run well on basic usage with very little data network connectivity. The major part of concern is only when you play videos or play games on the phone, or else all is good with the battery which seems low on capacity, given that the phone has a HD AMOLED display and some heavy core powering. The 12-megapixel camera on the Galaxy Alpha was another compromised feature, but again we understand these are bound to happen, but the 12MP camera doesn’t disappoint at all – in both photo and video capturing. The photos captured with crisp, clear and had a good color reproduction, even when previewing the same on larger screens, and having the 4K video recording capability although doesn’t seem anything great, it is a point to note that Samsung has tweaked the software quite well to take full advantage of the 12MP camera module. Though there was a good output in bright conditions, the Alpha camera did struggle a bit in low light conditions. There was loss of details, focusing on an object takes more than usual and the shutter gets too slow. The other problem with the Alpha and the 4K video recording, is the storage space. Just a minute of capturing 4K video takes up to 420 MB, and given the limited storage space on Alpha, that becomes a concern for regular shooters. As always, the camera app is loaded with options, effects for the user to play around with. Some modes include Beauty face, Shot and more, Panorama, Virtual tour and Dual camera. The camera review would be up soon for you to check out the quality. Because we said this is a metal frame device, don’t expect the entire smartphone to be rock solid. It is indeed one by looks, but the back cover is still made of polycarbonate and is similar to the ones you have seen in the past on Samsung smartphones. S Health app in the Galaxy Alpha is the same you would find on the Galaxy S5 and Note 4, and it works pretty fine, though not the best in accuracy. Also, we won’t suggest to rely on the Heart Rate Sensor on the back of the device, as we always feel that to be far from being accurate. The good part about the Galaxy Alpha was down to connectivity, where this smartphone doesn’t drop calls or doesn’t disconnect even on low network, unlike some other smartphones we noticed doing it to shift to lower band network, and that was quite annoying. The Alpha did a good job in connectivity, not just with the calls but also in data network and Wi-Fi. Having a plethora of options is not great, but actually doing well with the performance of them is what one would want, and the Alpha excelled in that. The battery in Galaxy Alpha is a deal breaker if you are a traveler and don’t rely much on Wi-Fi networks, because browsing normally on data network too consumed quite some battery. The battery on Moto X (2nd gen) is at question as well, when it comes to flagship smartphones this year, but the latter fares a little better than the Galaxy Alpha in this case. Speakers are aptly placed in the bottom of the phone, but the output level is low, and you cannot compare this with most of the flagships, which don’t fail in producing higher decibel levels and that too without a distortion. The quality is perfect, very crisp and clean sound but the sound level is kind of a disappointment. Again, the same question – is this one of the best smartphones till date? No, there are a few deal breakers, and many other smartphones excel in competition, but the Samsung Galaxy Alpha stays atop the list of the best Samsung smartphones (putting the stress on the word “smartphones” where the Note series gets ruled out). We’d never say this is better than the Galaxy Note 4, the phablet that beats every device out there with the performance, thus limiting this to smartphones, the Alpha is typically one of the best designed smartphones from Samsung. In fact, having no perfect smartphone that competes the Apple iPhone 5s with such a size, Samsung did lose a battle in the past, because the flagship series was all about increasing screen sizes. Also, the iPhone 6 too can see a good competitor in Alpha. This smartphone sits right in the perfect zone for those who were only comfortable with smaller phones, and wants a powerful phone with no compromises. We do know, except for the Sony’s compact series, none of those Mini versions were actually good in performance. The Galaxy Alpha is a rare perfect device from Samsung, and the company now just needs to make these little changes a standard for the future lineup of smartphones as well, especially with the inclusion of metal to make the phones look premium, as it is high time they stop producing those cheap plastic phones worth all the criticism. 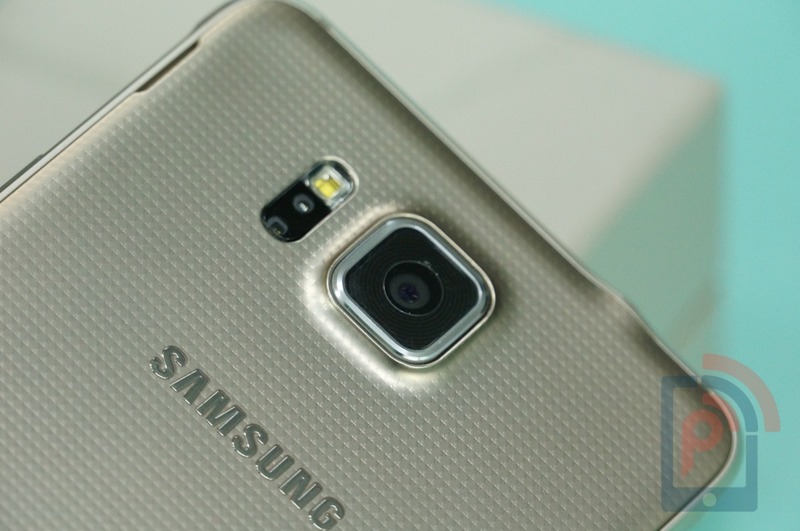 Samsung’s own Galaxy S5 launched with a hefty pricing initially, but later the pricing went down and now is almost the same price in which the Galaxy Alpha is being sold for. There are differences in both, but the S5 still isn’t a bad choice at all in this price, for a better display and camera. But at the same time, the Galaxy Alpha is not for everyone.